Join Kagan for this special opportunity at Kagan's headquarters in San Clemente, CA. This engaging institute is regularly priced at $449. 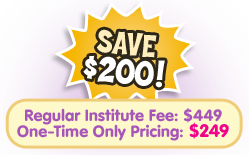 For this institute only, you can attend for only $249. This special discount is Kagan's way of saying thank you, and giving back to our local community.